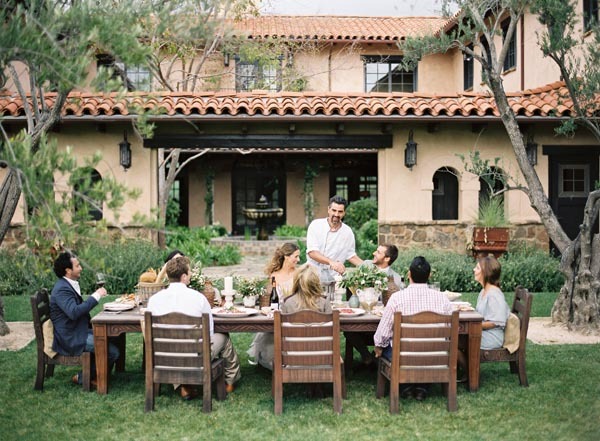 Entertaining in the Santa Ynez Valley Featured on: SB Diggs! 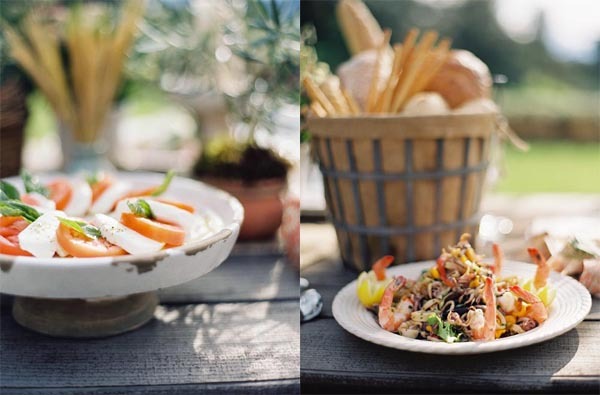 Event and wedding planner Jill La Fleur, Chef Leonardo Curti and a talented team of professionals create a smashing engagement dinner on a gentleman’s ranch in the Santa Ynez Valley, with photography by Jose Villa. WHEN CREATIVE SPECIAL EVENTS PLANNER AND LOCAL, JILL LA FLEUR, came up with the idea of creating an intimate & romantic engagement celebration, she knew just what to do. Often working with her equally talented teammate,photographer Jose Villa, Jill and Jose are two of the most sought-after wedding professionals in their fields. But their work often begins long before a bride walks down the aisle. 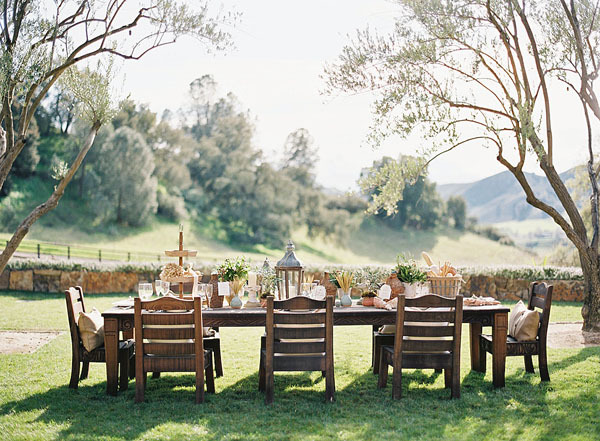 Case in point: a country-inspired celebratory engagement dinner party set on a gentleman’s ranch located in the heart of Santa Barbara’s world-famous wine country. The dynamic duo often draws inspiration for the creation and documentation of a special event from their home base: Santa Barbara wine country’s rolling, oak-studded hills dotted with vineyards and wildflowers. For this setting, Jill wanted to take advantage of the amazing location and the incredible Mediterranean-style hacienda. 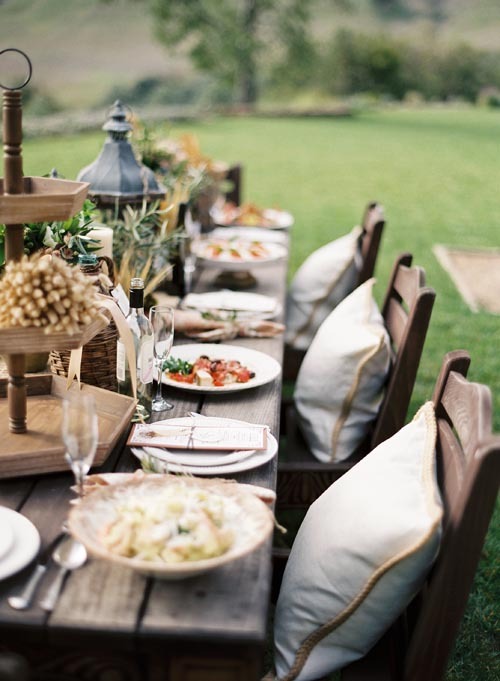 “The olive trees framed a perfect setting for a dinner party and I immediately visualized a long, rustic, wooden hand-carved table and seating with comfy pillows,” said Jill. To get in the mood, Jill “channeled” Ralph Lauren’s casual, yet elegant, style that fits right in with the Santa Ynez Valley lifestyle. Popular chef, and restaurant owner, Leonardo Curti created the menu. His restaurant, Trattoria Grappolo is a favorite of Santa Ynez Valley residents and visitors alike. He is also a top-notch caterer who prepares delicious, artfully presented cuisine, utilizing fresh, locally grown produce. Each course of the meal was paired with a different Santa Ynez area produced wine, and the selections included Brander Sauvignon Blanc, Arthur Earl Nebbioli II Re, and Epiphany Grenaches Blanc. 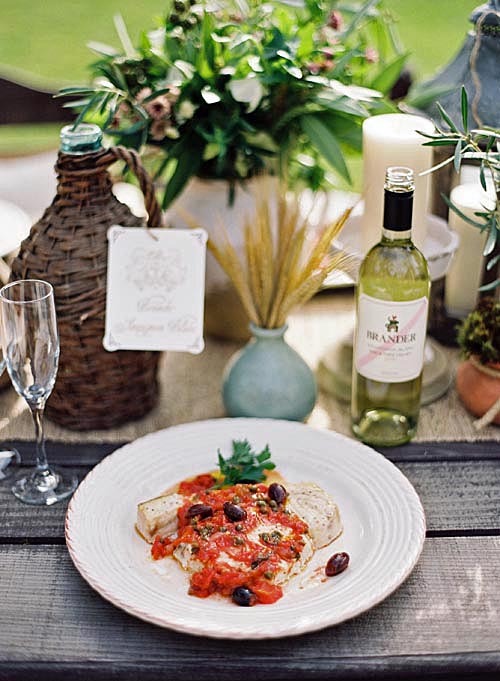 “I encourage couples to select local wines when planning a wedding or having an event in wine country. For guests coming from other locales, this is an ideal way to introduce them to the wine tasting experience,” notes the party planner. The menu crafted by Leonardo Curti started with Antipasti e Insalate Caprese (sliced local organic beefsteak tomatoes, buffalo mozzarella julienne basil seasoned with estate grown extra virgin olive oil, dried oregano, sea salt and freshly ground pepper) and Insalata di Mare (calamari and scampi tossed with roasted sweet bell peppers, kalmata olives, capers, parsley and finished with estate grown extra virgin olive oil, sea salt and freshly ground pepper). Leonardo choose Pappardelle con Carciofi Scampi e Ricotta Salata (homemade wide flat pasta with artichokes, scampi finished with grated ricotta salata and white truffle oil) for the pasta followed by Pesce Spada alla Puttanesca (swordfish sautéed with tomatoes, capers, kalamata olives and sweet onions) and Tagliata (grilled New York steak thinly sliced and seasoned with estate grown estate virgin olive oil and sea salt, served with baby arugula and shaved parmesan cheese). 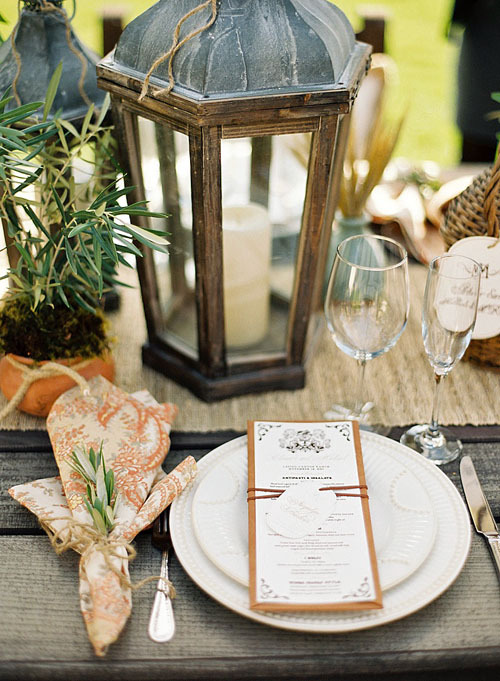 The Mediterranean inspired family-style dining created a intimate, relaxed vibe for the occasion, with small olive trees planted in rustic urns, candlelit lanterns, burlap mixed bread baskets, vintage woven wine jugs, and a three-tiered wooden dessert tray. 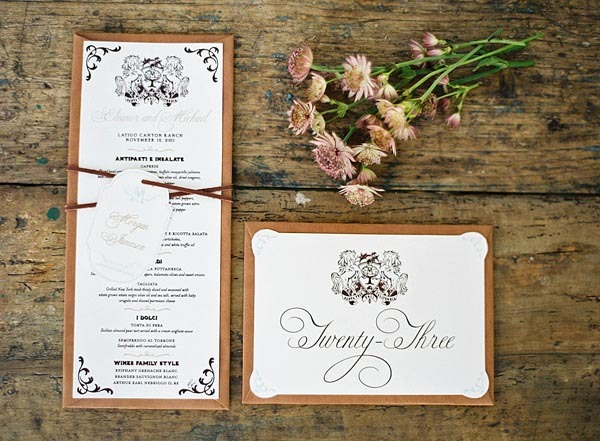 Invitations are created to fit each occasion and the invitation “suite” tells a story. It is an important element that pulls the entire look of a wedding or party together. For the engagement party, the menu was backed and tied with leather. A custom “brand” was created to provide the perfect touch that tied-in all of the printed elements together. Ceci Johnson, one of the top invitation designers in the country, created the suite of printed materials. 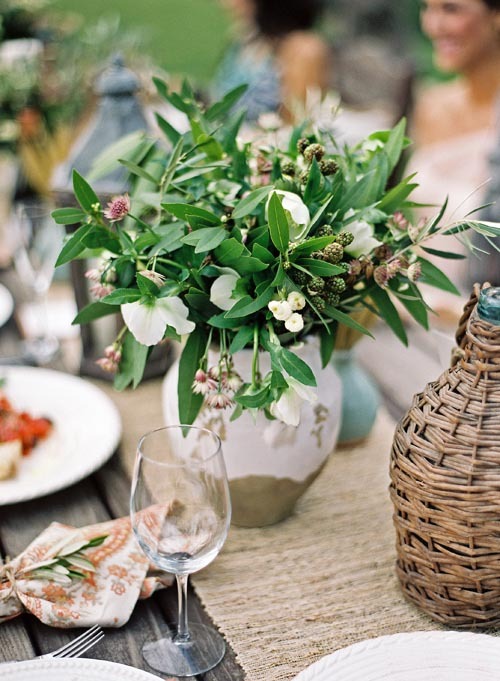 Minimal, natural looking, handpicked flower arrangements utilized bits of wheat, heather, olive branches and white flowers. “I like to work with my surroundings as well as the couple’s personal style. 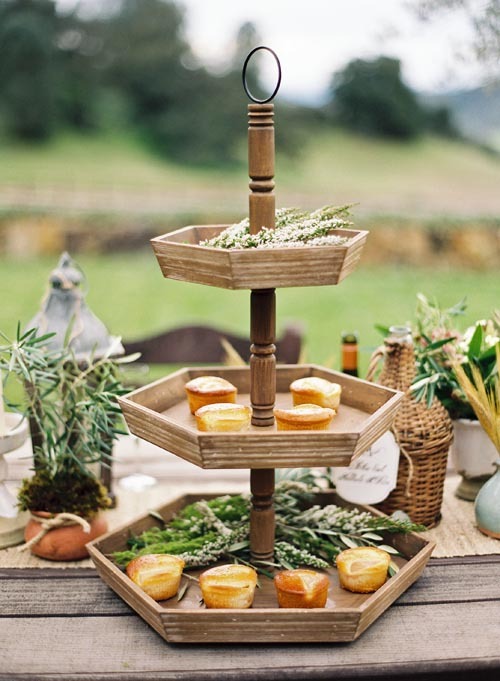 Cues for the tabletop design were taken from the ranch’s hand-crafted architectural elements. For a Mediterranean feel, Jill selected colors to complement the cuisine, including place settings in natural tones of whites, browns, stone grays with hints of blue-grey, sage and orange. Camilla Svensson Burns of Camilla Flowers helped find the perfect combination of flowers and greenery to add to the setting. Leaving no detail unturned: Jill La Fleur turned her designing eye to help the future bride with her engagement party wardrobe for the event. They settled on a Vera Wang dress in a soft, flowing and delicate fabric that would stand out amidst the natural setting. Jill added a thick leather belt and boots to kick up the ranch feel. The bride-to-be’s necklace was custom made by Baldazzi & Iacobellis, an Italian jewelry designer. Hair and makeup by Mar Romero. “The process of planning a party or a wedding is so rewarding, but what I love most is getting to know the couple or hosts, their friends and families, and working with an amazing team of talented vendors. They are truly what makes my job so wonderful and makes me successful in what I do,” Jill comments. 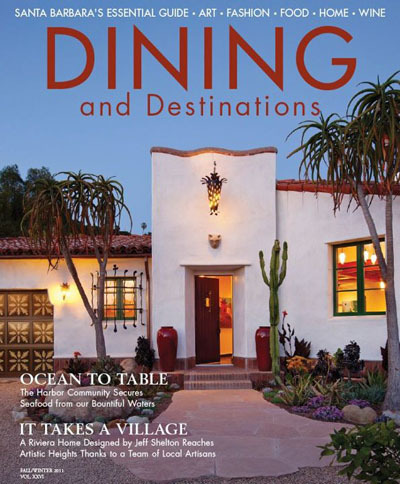 Jill La Fleur was featured in the fall/winter,2011 issue of Dining and Destinations Magazine. Pick up a copy at news stands in Santa Barbara, Montecito and Summerland. Wedding Preview: Catherine and Go from The Cana Family on Vimeo. Mike and Mia met through Match.com thanks to both of their mothers, who were tired of hearing how their son and daughter could never find anyone worth dating out and about. Mia had pretty much given up on the whole thing after a bunch of nice dates with great guys that she just didn’t really get excited about. Just by chance, Mia happened to notice an email from Mike. He was funny, clearly intelligent, and just plain interesting so she responded. On their first date, she dropped a piece of raw fish on her face, and Mike broke all her date rules and then got violently ill with swine flu on the drive home. Still, they both turned up for the second date and 9 months later Mia and Mike were engaged. 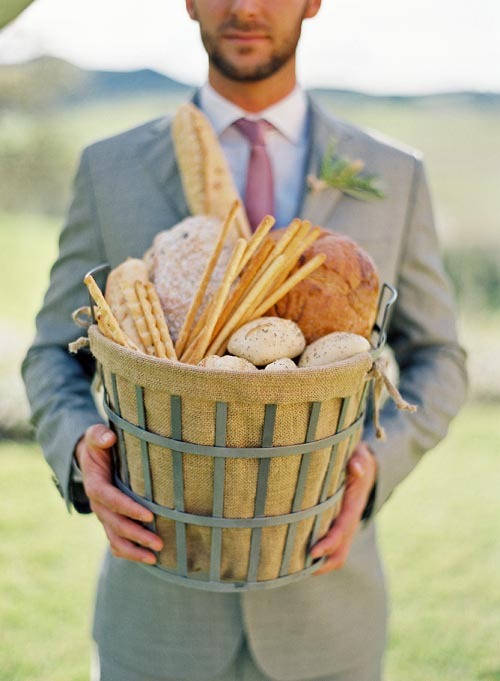 They wanted a rustic wedding that still felt sophisticated. Mia and Mike really wanted their wedding to feel intimate, which they accomplished by curving the ceremony seating slightly and creating one long head table for everyone to sit at. The intimate seating was contrasted by the big openness of the venue. For the backdrop, they had the gorgeous hills and the farmhouse, which is an actual West Virginian farmhouse that was deconstructed and rebuilt in California wine country. Most of the decor and little touches were made by Mia or Etsy vendors, aside from the pieces they used from their parents’ homes and weddings. Mazel tov, Mia and Mike!